Introduced in January 2007, the 32.8-ton CX290B is among the first models in Case's new CX B Series line of full-sized excavators. In addition to a 20-percent increase in fuel efficiency, the CX290B features faster cycle times due to increased hydraulic flow, up to 17 percent more horsepower, and an improved operator environment. Maintainability and serviceability have improved 39 percent over the previous model, as measured by the SAE maintenance score of 14,917 points. Product-line features: While Case's 290-size machine has jumped to the B Series, the larger CX330 model has itself undergone a significant upgrade. The 39-ton CX330's new Tier III engine uses a common high-pressure rail system, resulting in a 5-percent increase in horsepower, and 8- to 10-percent better fuel economy. Generating 268 horsepower to drive the new 79,700-pound Caterpillar 330D L excavator, the new Cat C9 engine employs ACERT technology. Cat's ADEM A4 electronic control module manages fuel delivery to get the best performance per unit of fuel used. The engine man-agement system provides flexible fuel mapping, allowing the engine to respond quickly to varying application needs. For reduced power consumption and reduced noise, the 330D L has a hydraulically driven fan controlled by the electronic control module. Product-line features: As part of the upgrades from the C-Series machines they replaced, each of the 324D L, 325D L and 330D L models rolled out in 2006 employs a new spacious, quiet cab featuring fully automatic climate control adjustments for temperature and air flow. The system even determines which air outlet is best in each situation. All glass is affixed directly to the cab, which eliminates the need for window frames. Pillar-mounted wipers also increase the operator's viewing area. 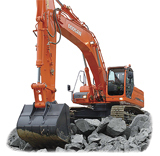 As part of Hyundai's new Robex 7A Series, the R360LC-7A excavator is powered by the Tier 3 four-cylinder Cummins QSL turbocharged engine that is SAE-rated at 271 horsepower. Improved fuel economy, better cold-starting capabilities, and 50-percent quieter operation are combined with heavy-duty engine design and surrounding infrastructure for reliability in the toughest working conditions. Underneath, the machine's reinforced box-section lower frame is engineered of all-welded, low-stress, high-strength steel. Product-line features: With the Robex 7A Series, Hyundai focused excavator improvements beyond improvements in engine and hydraulic performance to operator comfort. The new 79,590-pound R360LC-7A model provides operators with a wide, quiet cab featuring a full-view front window and large rear and side windows for visibility to all surroundings. Controls are located for minimum operator movement. With Doosan updating the former Daewoo product line, each of the new models in the DX Series of crawler excavators features an electronic package that allows communication between the engine and hydraulics for optimum performance and fuel economy. At the same time, a dual-walled exhaust silencer reduces noise levels with the DX models, which includes the DX300LC and DX340LC models at 66,580 and 76,621 pounds, respectively. Product-line features: The ergonomic DX Series cab is designed to pamper the operator with fully automatic heating and air conditioning, a six-way adjustable seat with lumbar support, and a telescopic control stand. The glass surface and a transparent roof section increases visibility. Operating costs are kept low through the ease of routine maintenance, extended service intervals and increased fuel efficiency. 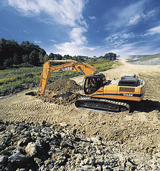 In 2006, Hitachi introduced the ZX350LC-3 excavator as an upgrade to the Zaxis 300LC. The new model keeps a number of the features introduced with the smaller predecessor machine, but also incorporates a beefier undercarriage and faster hydraulics, as well as a new Tier 3, six-cylinder Isuzu engine. A common-rail fuel-injection system and the cooled Exhaust Gas Recirculation system improve the 271-horsepower engine's output and fuel efficiency. Product-line features: A redesigned cab features a 47-percent increase in right-side visibility. Short-throw levers combined with armrests mounted independently from the seat result in fingertip control with less effort. Adding to the simple operation of the machine is a single work mode. The complete redesign extends to the multi-function monitor, which features large, easy-to-read gauges. Introduced in mid-2006, the JS330 excavator from JCB is available in a choice of standard, long-reach or demolition configurations. This Tier 3-compliant model boasts 25 percent more power, faster cycle times, and service access improvements. The cab has been updated in line with the other JCB "New Generation" models to provide greater visibility and comfort for the operator. Product-line features: The electronic management system of the Tier 3 engine allows the on-board computer system to control the power and fuel usage of the excavator with precision. This not only makes the JS330 a very efficient machine, but also increases output by obtaining the most out of the engine and hydraulics. True ground-level servicing is possible because the engine oil level is checked electronically and displayed in the cab. The Powerwize III engine/hydraulic management system on the John Deere 350D LC excavator simplifies the operator's choice to either work or attachment mode. The computer automatically adjusts swing, boom and stick priority based on operator inputs through the pilot levers, and will deliver a temporary power boost when the hydraulic system is taxed. According to product marketing manager Mark Wall, customers most often remark that these excavators perform predictably in changing conditions, that operators know the machine is going to react to expectations. Product-line features: John Deere's on-board data-logger records operating parameters such as engine speed, coolant temperature, hydraulic pressure and temperature, travel time, swing time, idle time and fault codes. Downloaded to a computer via a mobile device, Deere's Machine Information Center can provide data in user-friendly formats to help contractors predict maintenance and be more productive. As with all new Kobelco excavators, the SK350LC model boasts increased hydraulic performance, along with increased bucket breakout force, swing torque and drawbar pull force for digging trenches, setting pipe and loading trucks. Introduced last fall, the SK350LC is powered by an electronic fuel-injected Hino turbocharged engine generating 264 horsepower. At 79,600 pounds, the SK350LC digs to 24 feet 10 inches, and reaches to 36 feet 3 inches at ground line. Product-line features: Kobelco has focused on operator comfort, providing seven-way adjustable seats and near 360-degree visibility. Operating features include four working modes to match the application, improved grading and leveling capability via the Intelligent Total Control System, and one- and two-way hydraulic flow controlled from inside the cab. Introduced by LBX in January, the Link-Belt 290 X2 excavator incorporates a horsepower boost from 177 to 207 without an increase in fuel consumption, thanks to a re-engineered Tier 3 Isuzu engine. Providing optimum power are new work modes, including speed priority mode for fast cycle times, attachment mode to match output with auxiliary attachment needs, applied power mode for heavy lifting and precise placement, and heavy mode for general purposes. The 9-percent power boost automatically engages in heavy mode and stays on in applied power mode. Product-line features: On both the new 290 X2 and the established 330 LX excavator models, the two-speed boom lifting and arm open/close functions work in conjunction with the hydraulic system to enhance digging, lifting and swing. 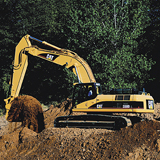 The load-sensing, automatic power boost allows the machines to power through tough digging conditions. Daily maintenance is made easy via remote ground-level service access to the engine oil filter, fuel filter and engine oil. Over the B Series models, Liebherr's R934C and R944C excavators integrate a bypass valve into the main control block to allow simultaneous travel and lifting duties without the loss of flow or pressure to any function. Hoist cylinders with integrated load-holding valves combine with "regeneration plus" pressureless boom lowering to allow gravity to lower the boom with no oil flowing through the control valve, resulting in more efficient operations. Both Liebherr models covering the 30- to 40-ton excavator market feature more powerful, purpose-built, Tier 3 Liebherr D936L diesel engines. Product-line features: The R934C and R944C feature a dedicated third pump exclusively for swing, reducing cycle times in production applications. The rotating deck features two different boom-mounting positions, so that the machine's digging envelope and lifting capacities can be maximized. Cast components in high-stress areas of the attachment ensure durability and long life. Standard semi-automatic centralized lubrication allows the operator to grease all lube points without leaving the seat. Updated as part of Terex's ongoing program to update the excavator line,the new TXC 300LC-2 and TXC 340LC-2 models feature a new pattern change control that allows operators to change the control pattern to best suit their particular operation style and background. This is ideal for rental yards that need to accommodate as many operators as possible. The LC-2 models feature a wider, roomier cab with automatic climate control that has 20-percent more cooling capacity and 8-percent more airflow, yet less noise generated by the new Tier 3 engines. Product-line features: Now offering an excavator lineup ranging in operating weight from 3,395 to 104,900 pounds, Terex incorporates the e-EPOS electronic power optimizing system that communicates with the engine and hydraulics to help maximize work efficiency and minimize fuel consumption. For operators, a multi-functional color monitor provides quick viewing of performance and maintenance data from within the cab. Over the past 18 months, Komatsu has introduced updated editions of each of its excavator models in the 30- to 40-ton range. And, even with the tight scope of that particular size range, the variety of excavator solutions offered by Komatsu is clearly exhibited. Aside from the standard PC270LC-8 and PC300LC-7 models, the company introduced an updated PC308USLC-3 model, bringing the benefits of a short tail swing excavator to applications requiring larger machines. At the same time, the PC300HD-7 incorporates the 300-size upperstructure with a 400-size undercarriage for extra stability and lift capacity. Product-line features: An improved pump flow merge divide valve combines with high-efficiency components to enhance Komatsu's hydraulic system, as evidenced in the new PC270PC-8. The 300-size machines are equipped with two boom mode settings; four working modes; and Power Max to match engine speed, pump flow and system pressure to specific job needs. The PC308USLC-3 offers two working modes, one with four level settings. All of the machines come equipped with the Komtrax wireless monitoring system as standard.